Anew snow flakes are pouring from the sky outside. This time the pink flowers of the Christmas cactus are shining on curved branches. It becomes warm and cozy at home and it seems that spring is about to come. 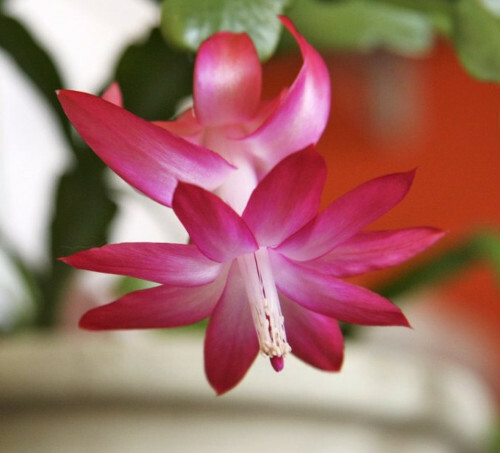 Christmas cactus is a popular name due to the fact that the plant starts blooming in December on the Christmas and continues in January on the Orthodox Christmas. Due to such unusual flowering periods for our latitudes, people in Russia call it a common name “Decembrist”. There is a scientific name Schlumbergera or Zygocactus (Zygocactus). What is Schlumbergera in a wild? Wiki answers: Plants grow on trees or rocks. Most species of them have stems which resemble leaf-like pads joined one to the other and flowers which appear at the joints and tips of the stems. Two years ago I'd planted small cuttings of Schlumbergera leaves in pots and after 2 months they rooted. I think that the most inexperienced gardener can grow this plant and enjoy looking at it. Now my Christmas cacti are in bloom. This December Christmas cacti have begun to bloom early. Because I had placed pots on a cool windowsill and watered a little, flower buds appeared and started to enlarge. Do you love this plant? What do you suppose if it is easy in growth or not? It is a beautiful plant and if even the most inexperienced gardener can grow it then it is exactly what I need! I had one of these plants and they were a joy - however, it got a virus I think but anyway it died and I did not find out why. Unfortunately Christmas cactus may have any diseases, Jenny. It's a pity you lost your plant. Надежда,красивое растение! Цветок нежный! Люблю декабрист,,его у меня сейчас нет,как-то о нем я забыла.Больше нравится самой укоренять растения,,тогда они у меня долго растут и красиво цветут. Мне тоже нравятся свои выращенные растения, они более выносливые. Этот декабрист тоже их черенков. They are so pretty, and I had many of them before. Nice to have plants who flower in the wintertime. Here it rains all the time, and it's so dark every day. Soon the sun turns, and I look forward to it. Marit, I do count days when the sun turns, ha ha. I'm tired of so dark days, but this flower glad me. Es muy bonita. Las mías todavía no florecieron. Besitos. I have one plant but she is already finishing her blooming. Lucja, I remember your post with photos of your Christmas cactus - it was beautiful, I can imagine how it bloomed this year. How beautiful your home is, Anne. Happy new week! While I would agree that this type of cactus is easy to grow I have managed to kill all of mine. I had the same plant for YEARS and then all of a sudden it died. I never figured out why. Yours is a beauty. The blooms are to savor and enjoy. I love your header photo. Those berries look like Snowberry bush berries. The birds eat these in my garden as soon as they become ripe. I never get to see them when all of the leaves are off the bush. Yes, these are snowberries on my header, Lisa. I have no idea why, but this fall the birds did not eat them at all, perhaps they have a lot of food, and I feed them every day when I come to the garden. The reasons why your cactus died may be different. In this case, I try to have cuttings to save the plant. All members of the Cactaceae family are so beautiful. Christmas Cactus is also called Crab’s claw cactus. This beautiful cactus has many names. Yours is absolutely fabulous. Have a nice week of December. Kiitos, Kruunu Vuokko, I love the name of Crab’s claw cactus. I love your Christmas cacti Nadezda. They are beautiful! Mine are starting to get buds. Hopefully they’ll bloom just in time for the holidays. It would be very nice in your home, Lee. Christmas cactus blooms at Christmas time. Que preciosidad Nadezda. La tiene preciosa. Esas plantas son muy generosas. Te deseo un buen diciembre amiga. Gracias, Laura. Espero tu tienes cactus de Navidad en tu casa tambien. Beautiful cacti! Mine aren't blooming at all yet! I don't know why. They bloomed for so many years, but not this year. They do seem to be easy to care for. I like your header also. I agree they are easy in growth, Wendy. Your cactus plant bloomed so beautifully! Like the fuchsia color and your wonderful pictures! Wishing you a lovely day and a happy week! Happy December! I love their fuchsia color as well, Dimi. The flowers decorate grey days very much. yes, you could grow beautiful flowers. Congratulation. Evi, the Christmas cacti get rooted very soon and only "inexperienced gardener" has to care well to see the flowers. I do like the plant but haven't had one for a while. I think ours ended up being attacked by mealy bug. Yes, it maybe, Sue. Hopefully mine are healthy, I should spray them against bugs later. I love this cactus, and cannot imagine how it looks growing in the wild. My favourite plants are generous ones that get rooted very easily. Schlumbergega is that one, Sue that is getting rooted very easily. Beautiful cactus flower, Nadezda. Christmas is near. I wish you a happy December! Happy December to you too, Tania! Thank you for stopping by, Anas! Beautiful!, I have never seen that color of the bloom here. Oh, this color is pretty, I agree Endah. This is a favorite plant of mine and I have several because they root so easily. Your blooms are beautiful. Thank goodness for these sweet plants that bring such color and joy to this dark season. I agree, Peter these blooms bring color and joy to the dark days. Nadezda, I love your Christmas cacti, especially the last photo. Sometimes I break a piece off and put in a jar of water on the windowsill. Before long roots will appear. I try this with many different plants. Sometimes it works and sometimes not! Hope you are keeping cosy and seeing some sunny days. Betty, you're right - Schlumbergera get roots easily. I do the same with cuttings, sometimes I just push them into the pot. Sunny days were last week, now it's light rain with snow. It is Christmas on your window cill already! How wonderful! Yes, indeed Tistou, have a nice week! Such beauties, Nadezda! Wonderful photos! Nostalgic to me, my mother always had them when I was a child. How much snow do you have now? We have 5 - 10 cm and the temperatures just below zero. This December there isn't much snow in St. Petersburg, when +2 .. + 3 C snow melts and then falls again when -2 ..- 3 C. Nature is mostly grey than white. Thank you Sakuranko for stopping by my blog! Your Christmas Cactus is a beauty. I have a white one and it´s a very easy to grow plant. I wish we had some snow. Anything better than the grey dark days we have in Holland. Marijke, I do prefer white nature than the grey one.These days the weather changes, snow - rain - snow melts. I'm glad you're blogging again. Thank you Alistair, Christmas cactus is a popular plant in many homes. The cactus flowers are usually very beautiful, yours are so lovely. Wonderful pictures, I especially loved the last, it is spectacular. You're right Maria. I love them blooming in dark days, they bring color in winter.